Thank you!!! Thank you for building such a great saddle pads and products!!! We love our 5Star pads and products!!!!! I bought my first 5 Star pad over 15 years ago. I have had several over the years. In fact when I took it to the factory I was told it was one of the very first hand made models because of the gullet size. When I started looking to replace it and become a dealer I inquired to everyone I could about what was the finest saddle pad made. I always heard about this little outfit in Arkansas called 5 Star. I thought I knew that, but when I started as a dealer I was even more convinced. I have sold a lot of pads to my customers and I hear a lot of "I really like my pad, I need to buy another one." I tell my customer this is the best investment you can make for your horse. This is the best wearing, best fitting pad on the market. Made in America. 100% Virgin Wool. The folks at 5 Star always stand behind their products and do what they say. The dealer education and information is excellent too. I am very happy with your saddle pads. I rode with Impact Gel pads for 4 years, up until I found your pads. I now own three 5 star saddle pads and I have since sold all my impact gel pads. 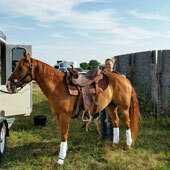 Your saddle pads have really made the horse industry a better place, now I can depend on your products to keep my horses from getting sore with all the strenuous activity they go through each summer and winter. I recommend your products to everyone I meet. 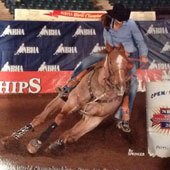 I honesty will NEVER go back to using impact gel, because they made my horses sore and hindered their performance. Thanks for providing the horse industry with a pad they can trust for the next years to come. I am just sending you a quick note to let you know how much I love your 5 Star Pads. I have been using them on my colts and show horses for about 7 years now. 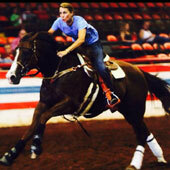 I train cutting horses and just started into reining horses. 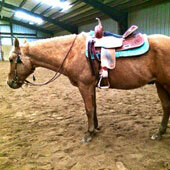 Both disciplines require a lot out of my horses, and I have never had a sore backed horse yet. I brought a few up for some clients of mine that are into western pleasure and roping, and they are as pleased as I am. In fact, I need to put in another order! Keep up the good work! My horses and I are depending on you.